Somehow during the course of my gardening years I developed an aversion to hollyhocks in my garden. I don’t know when or how this benign prejudice arrived and took hold in my mind, but it was strong. Perhaps it had something to do with the memory of seeing a large stand of hollyhocks decimated by Hollyhock Rust (http://plantclinic.cornell.edu/factsheets/hollyhockust.pdf) in front of a beautiful, quintessential New England inn. I was repulsed by the ugliness of the rust contrasted with the beauty of the bloom. 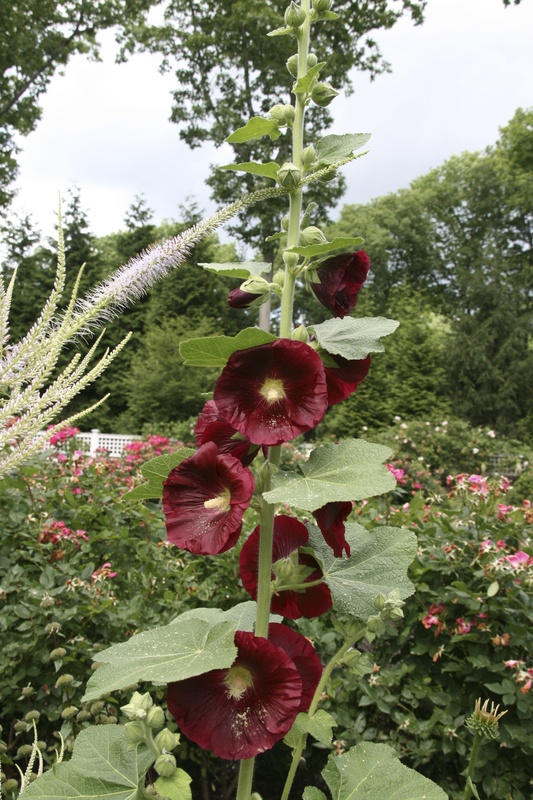 This unpleasant image coupled with my (then) ignorant belief that hollyhocks were difficult to grow and fussy to have in the garden ensured me a hollyhock free garden. No longer. A couple of years ago in the cold of a January night I perused a seed catalog where the colors and height of the hollyhocks called to me. As one does in the winter when gardening possibilities seem endless because there is no gardening happening and catalogues are beguiling one with pictures of perfect, effortless gardens, I thought to myself, ‘Why not try a packet of hollyhock seeds?’ I brought a pack, potted them up, put them in my garden and watched them grow into magnificent perennials. I now try to have hollyhocks every year. 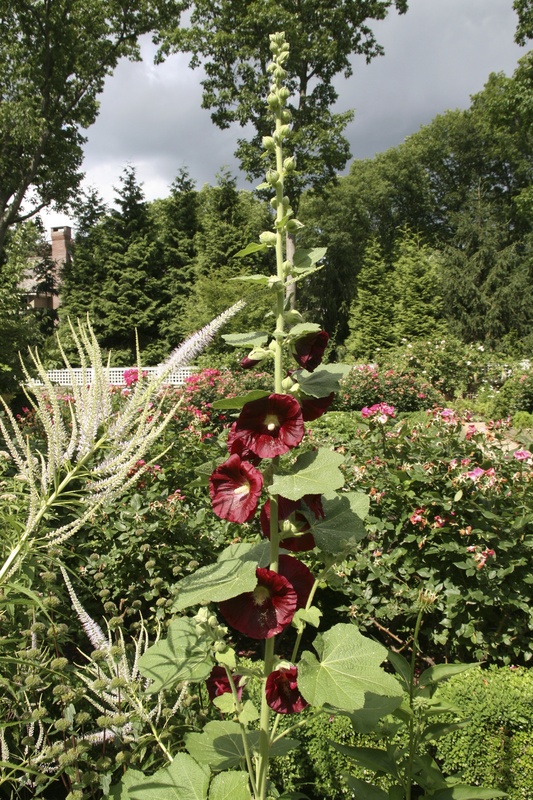 They are easy to grow from seed, not at all fussy in the garden, and due to the good air circulation and hygiene I provide, there is no sign of hollyhock rust. They bloom for weeks, and give wonderful height without taking up too much lateral room. They like average, moist soil and sun – nothing fussy about that. They are considered perennial, with claims that they live 2 – 3 years, but I have not yet had a repeat performance from any of mine, most likely because I do not cut them back after they are finished flowering as recommended. I treat them as annuals, one of the very few ‘annuals’ I have time for in my garden. 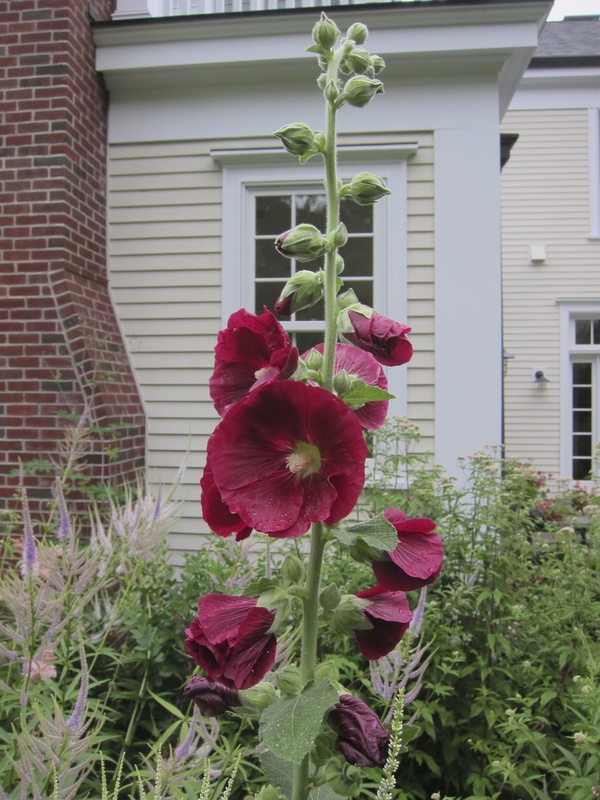 With color, habit and grace like this, hollyhocks will always be welcome in my garden.